Quality & 100% satisfaction is our goal. If something is not right, please let is know. Old fashioned holiday favorite. 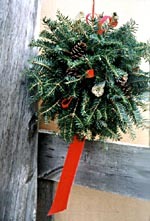 Hand tied, using fresh Balsam Fir greens. 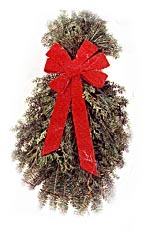 This is double sided, round garland excellent for all uses: draping, wrapping, door outline, staircases. Many business drape our garland at their entrances. *Custom lengths available - call for prices. A simple and elegant mixture of Balsam, Pine and Cedar, this makes a stylish addition to any decor. Trimmed with a wide velveteen bow and brass bells. Approximately 24" long.